Bedrock, DDB Remedy and Insypher each scored two Golds at last night’s PM Society Digital Awards 2018 in London. Bedrock picked up its prizes in the Congress, Meetings & Events and Corporate Communications categories, DDB Remedy won in Film and Innovation – Creativity, and Insypher took home gold in Market Access and won Best Agency Digital Team. Meanwhile, VCCP scooped four awards in total – a Gold, two Silvers and a Bronze, and Four Health took three, including a Gold, a Highly Commended and a Bronze. There were Golds too for Big Pink, emotive., Hamell, Pegasus, The Purple Agency and 90TEN. 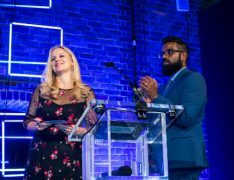 Awards chair Rachel Farrow (pictured left with awards host Romesh Ranganathan) said: “As we saw in 2017, there has been a wide spread of Gold awards across the agencies showing that there are numerous highly talented agencies producing outstanding digital work. 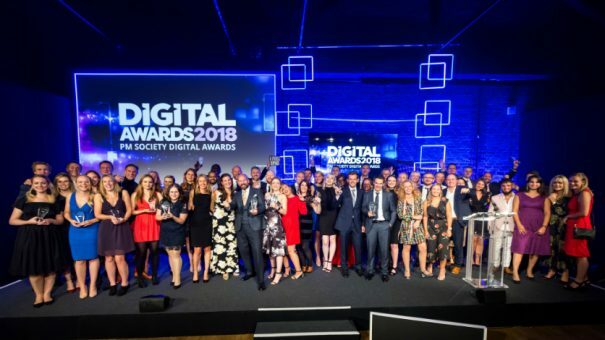 The PM Society Digital Awards 2018, now in its ninth year, saw the addition of a new category, that of Pharma Digital Partner, which was won by Norgine’s Kym Jacks Bryant, who saw off GSK’s Mary Andrews and Novo Nordisk’s Kasper Kofod. Industry-side, Gilead was the only company to take two Gold Awards, one for its innovative HIV patient programme and the other for the film Are you Chris? Meanwhile, ViiV Healthcare, Teva and Celgene all took a Gold and a Silver. DDB Remedy – Are you Chris?